Be prepared for your mouth to water because this peach chipotle BBQ sauce recipe will beat the breaks off of your old favorite chipotle sauce. Just give it one shot and we promise you’ll be saucing your meats with this stuff over and over again. To start this peach chipotle bbq sauce recipe, the first thing you’ll wan to do is prepare the ingredients. Cut the jalapeno pepper across its length, remove the seeds and stem, then dice it up. Also remove the seed from both peaches, then dice them up. Heat up a drizzle of oil in a pan, and cook the diced pepper until it softens up. Once that’s done, add all of the other ingredients, one by one, leaving the diced peach and tomato for last. Crush the tomatoes by hand before adding it to the pan. Bring to a boil, then reduce heat to low and let it simmer for approx. 1 hour. When ready, pour the sauce in your food processor and blend until smooth. 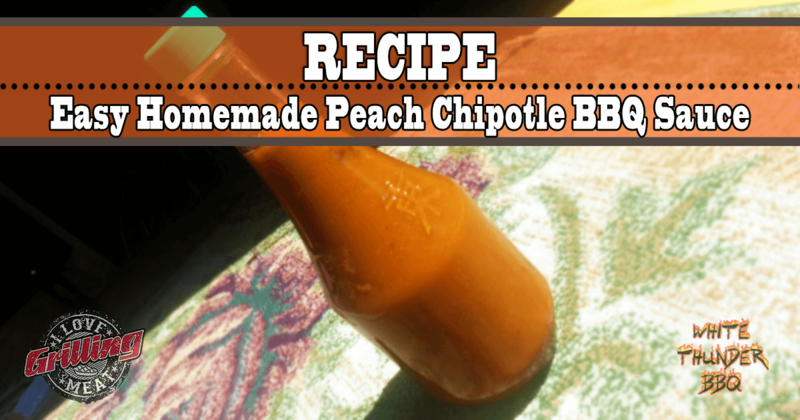 Hopefully you enjoyed this peach chipotle bbq sauce recipe! DAD The Man The Myth The Grilling Legend! Visit my YouTube channel for more mouthwatering recipes. How long will this BBQ sauce be good if refrigerated? We typically keep homemade BBQ sauce in the fridge for 5-7 days, especially if you’re using fresh ingredients, but it’s really up to you.